Haf is the Welsh word for Summer. And the Hosta is sometimes called the August Lilly for its summer bloom. 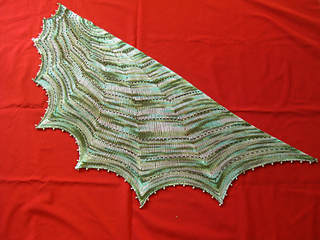 Beginning with just one slip knot this shawl is worked from the top down, shaping is created with short rows and increases. You may choose from three styles, beaded, striped and color block. You may choose three borders, beaded, lace and garter. The possibilities are endless, one is never enough! Specific instructions are given for the beaded version which include bead counts. Beaded version is 50 inches wide by 20 inches deep. All other versions you may work until you run out of yarn or are happy with the size. 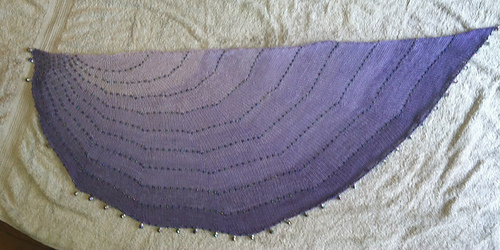 Beaded Version-1 skein 330 yards of Nuna Fina heavy lace weight yarn. For all other versions you may use any weight yarn you like and work until you run out of yarn. Beaded Version-US size 8 needle or size needed to obtain a gauge of 4.5 sts per inch. All other sizes you may use a needle that gives you fabric you like. A crochet hook or wire to place beads.